TV show dates: August 10, 2018. Performers include: Joseph Simmons, Justine Simmons, Kiana Ledé, Nathan Anderson, Leah Rose Randall, and Maceo Smedley. 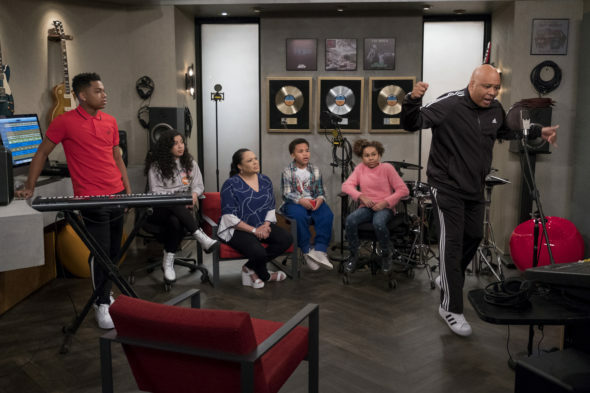 Although it is a scripted comedy, the All About the Washingtons TV show is also a fictionalized autobiographical series about the family life of its adult leads, Rev Run aka Joseph Simmons and his wife Justine. The sitcom centers on Joey (Joseph Simmons) and Justine Washington (Justine Simmons). After Joey retires from his storied hip-hop career, Justine decides it is time to spread her own professional wings. As Justine uses her newfound freedom to pursue a career, it is Joey’s turn to be the primary caregiver to their children, Wesley (Anderson), Veronica (Ledé), Skyler (Randall), and Deavon (Smedley), and keep the home running smoothly. What do you think? Do you like the All About the Washingtons TV series? Should this Netflix TV show have been cancelled or renewed for a second season? More about: All About the Washingtons, All About the Washingtons: canceled or renewed?, All About the Washingtons: ratings, Netflix TV shows: canceled or renewed? Can’t believe they would cancel a really good show hope someday they’ll bring it back. it seems to be a nice family show, love to watch it with my 8 yr old daughter and would love to see it have more than one season! I think this show is so good, first time in a long time that we get to sit down and watch a show together as a family. love it! This show is great! Justine is a natural. We love it! I really like this show. Please do not cancel!